… can Uncle Sam be far behind? LeBron James and another day of the “jock tax”… biggest outrage ever in five years of “new taxes and weird fees”… a British forex trader’s take on the Brexit… and more! The dam just broke: Microsoft is making pot investing respectable. Yesterday, we explained why we’ve jettisoned our long-standing reservations about “pot stocks.” Indeed, we have strong reason to believe the federal government will take marijuana off its “Schedule I” list of forbidden drugs sometime in the next six weeks. That one act could turn what’s now a $5 billion industry into a $100 billion industry. Nothing like an idea whose time has come, we say. In marijuana, Microsoft sees an opportunity to grow its “cloud computing” business — the growing trend in which companies and governments outsource their data storage. Rather than have a roomful of servers taking up space (and air-conditioning costs), companies and government agencies store their data on remote servers hundreds or thousands of miles away. Microsoft’s software will link pot-oriented businesses with the state governments keen to keep a tight regulatory leash on those businesses. Also noteworthy is a tiny company Microsoft is teaming up with. It’s a privately-held firm called Kind that built the software. But that’s not Kind’s major line of business. Kind develops workarounds for the fact pot businesses are cash-only enterprises — cut off from access to the banks under Federal Reserve rules as long as pot remains banned on the federal level. Kind’s products include ATM-style kiosks that make marijuana transactions easier. “Microsoft will not be getting anywhere near these kiosks or the actual plants,” the Times hastens to point out. But just the fact Microsoft is willing to do business with a company that does is a major development. The next domino to fall could be huge — the federal government removing marijuana from its Schedule I list of prohibited drugs. As we said yesterday, Ray Blanco of our science-and-wealth team has strong reason to believe that will happen this summer, when the Drug Enforcement Administration responds to an inquiry from a group of U.S. senators. Among Ray’s many reasons he thinks the feds will reverse course: The government already has a patent for medical marijuana. For real. It’s Patent #6630507, issued to the Department of Health and Human Services. “The patent describes how the use of certain chemicals found within the marijuana plant is highly beneficial in treating certain neurodegenerative diseases such as Alzheimer’s, Parkinson’s, HIV and dementia. Microsoft just set the pace. The government will likely follow within weeks, maybe even days. Investors who position themselves ahead of a federal reversal on pot policy stand to gain big. How big? Ray’s done the research and sees the potential to make nearly 15 times your initial investment. We urge you to examine his research right now — while there’s still time. To the markets, which do appear to have been moved by the assassination of a British politician. As we went to virtual press yesterday, police confirmed the death of Jo Cox, a Labour member of Parliament. Gold’s run past $1,300 suddenly reversed. A rally in government bonds also fizzled. It’s as if the safety trade prompted by jitters over a potential “Brexit” was no longer operative. “If the supposition of the market is right — that this was a politically motivated act — it’s probably going to alter the calculus for the vote,” currency trader Boris Schlossberg from BK Asset Management told MarketWatch. The thinking goes like this: Earlier this week, polls indicated a majority of Britons would vote to leave the European Union. But that might change now that a pro-EU politician’s been killed, and mainstream media reports link the suspect to hard-core British nationalists and even the neo-Nazi National Alliance here in the United States. Or to put it more bluntly, Boobus Britannicus might start to think “Brexit supporters = wack-jobs” and vote to stay in the EU. In any event, gold’s run past $1,300 lasted barely 12 hours, and as we check our screens this morning, the bid is $1,287. Likewise, the yield on a 10-year Treasury didn’t spend much time below long-standing support at 1.6%. It’s back to 1.61% as we write. The major U.S. stock indexes have taken a long round trip in the last 24 hours — up by yesterday’s close, down again this morning. The S&P 500 rests at 2,065. The one economic number of note today is housing starts — down 0.3% in May, but up 9.5% year over year. Permits, on the other hand, are down 10.1% year over year, and those are a better indicator of future activity. But the numbers aren’t enough to dissuade housing bulls: “The housing and construction sectors are showing bursts of strength and in general are trending higher, providing a highlight for what is mostly a modest outlook for the economy,” says an Econoday summary reflecting mainstream consensus. Crude is stabilizing after its near free fall this week. A barrel of West Texas Intermediate fetches $47.43 — up nearly 3% from yesterday but still down 7% from the highs late last week. Where to from here? 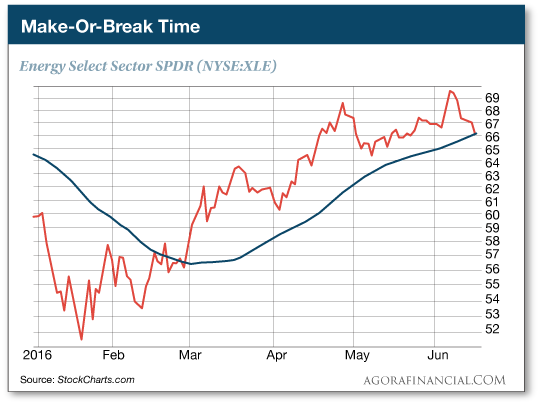 Watch the energy services stocks, says Greg Guenthner of our trading desk: “The Energy Select Sector SPDR (NYSE:XLE) is fighting to stay above its 50-day moving average for the first time since oil began its comeback move in early March. Bad news for LeBron James and his teammates: The Cleveland Cavaliers will play a Game 7 for the NBA finals, but their tax bill will be higher as a result. The jock tax is imposed by 21 states and eight municipalities. California’s is highest, at 13.3%. And it’s not just jocks who incur the liability; support personnel like trainers and equipment managers who travel with the team also have to pony up. “New taxes and weird fees,” Canadian edition: Our ongoing chronicle of money-grubbing local governments, now stretching into its sixth year, serves up one of its most outrageous examples to date. “As I came up to the stop sign, I stopped and looked and I saw this homeless guy holding a sign,” recalls Dane Rusk of the day last week when he was pulling out of a shopping mall in Regina, Saskatchewan. “I reached out — I had to undo my seat belt, hang over and drop the change on the curb,” he tells a local TV station. Turns out the “homeless guy” was an undercover cop. Because Mr. Rusk unfastened his seat belt, it was an instant $175 fine. “I noticed your comments about the Brexit, notably Parliament having the last word regardless of the outcome,” a reader writes from Switzerland. ‘First of all, and despite recent polls, bookmakers are still offering odds against Brexit. Personally, despite being a Eurosceptic for many years, I will vote to remain, as I think the Brexit side does not have a clear plan and that we should instead make the EU revise dramatically the way it is run. ‘Yes, I do believe Parliament has to ratify, which means 51-49 Brexit might be overturned. “Personally, I have been involved in forex for about 30 years on a professional basis and am still watching what happens. Mind you, I will not indulge in any GBP transaction in the coming week; sometimes I like gambling, but this time, it’s too serious to play around it. “My arguments are just an additional piece of the puzzle, and you have been the first ones to raise the question. The 5: Thanks for the insight! P.S. Jim Rickards asks just 48 seconds of your time. When those 48 seconds are over, you may question everything you know about gold. Including the recent price action. Will you still buy gold after watching this?